Before you dismiss your “old” bindery equipment as inadequate, consider some of the ways in which it can outperform new automated equipment. Believe it or not, old equipment occasionally has surprising advantages over new with efficiency, capabilities, and cost. Our goal here is not to minimize the advantages of modern equipment. Rather it's to encourage you to think about ways to maximize efficiency on print finishing machines you currently have on your shop floor, perhaps in ways you might not have thought about. To that end, we thought we'd share these examples with you. During the 90's, the company I worked for acquired a 60's vintage McCain which allowed us to produce complex saddle-stitched catalogs that our competitors with high-speed stitching lines couldn't. (Note for McCain owners: we have a Spine Creaser to fit your cover feeder.) The inserters on old McCain saddle stitchers are versatile, often more so than many newer feed pockets. It let us feed a mix of signatures (with and without lips), cards, reply envelopes, and covers. The ability to produce these jobs automatically was more important than the speed at which they could be produced. In another example of old out-producing new, Rodrigo Castellanos of Technifold Mexico tells how his older gathering machine made it possible to win a large collating job for a spiral bound book. The cover was 12pt but the coupon inserts were single sheets of 90gsm paper. The newer, automated gathering machine at a competitor wasn't able to handle the job. The automatic gripper settings were too inexact to grip the light stock and adjustment was a problem. Meanwhile Rodrigo's old Muller gathering machine was manually adjusted to grip the sheet and run the job without any problems. In an article in The Binding Edge, print finishing consultant Brad Emerson says, “Scheduling two jobs of nearly the same size is as efficient as the highest level of automation on even the most prehistoric piece of bindery equipment.” Everyone knows this but in practice jobs get prioritized according to many factors—deadlines, customer value, or by whomever screams the loudest. It rarely comes down to prioritization according to the bindery's needs. Yet sometimes a few phone calls in advance of deadlines can improve efficiency by re-scheduling in a way that suits the bindery's size considerations. In another example from Rodrigo Castellanos, there is at least one disadvantage to setting up an automated, continuous-feed folding machine. With a new automatic feeder, you must wait until all the paper runs out until you can reset the feeder in order to begin loading the next job. Only after it's set can you begin loading it. Depending on the sheet size and folder speed, this can take up to 10-15 minutes. With a manually set feeder, you can start loading the feeder almost immediately. As soon as the tail end of the job you're running starts to edge around the feeder drum, you can reset the upper in-feed guide. (photo lower right) Then you begin loading the next job. (Note: There are times when a larger sheet may not be possible to load like this.) When the previous job runs out, finish setting the lower feeder components. A busy bindery might do several jobs a day like this. If you have to wait ten minutes per job to start loading, you lose a lot of time. Bear in mind that I'm not saying that automated equipment won't save you time and money. It will when you have the right equipment for your workload. The important point I'm making is that with older bindery equipment you can get increases in productivity that are comparable to automated equipment. This little trick with the feeder is one way to one-up an automated machine! Another example are the fold roller caliper settings. 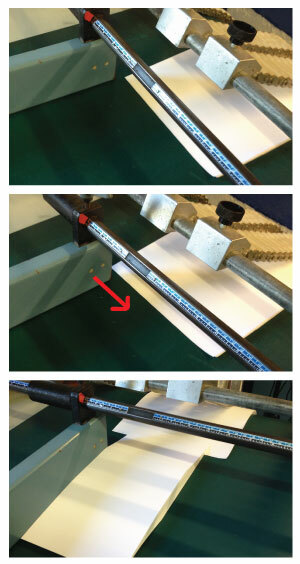 On automatic machines you tell the folder what paper you're running and it will adjust the fold rollers. However, when it comes to fine tuning it becomes tricky to fine tune the pressure as needed via the interface. Old machines are easy to adjust. You simply turn a knob on the caliper until you get the pressure you need. The point here is that you may have to come up with new troubleshooting solutions on automated machines. If you run a variety of work, as in a trade bindery, you want to be sure the new equipment (and its operator) are equipped to handle the unexpected. In some cases, an older, easier-to-adjust machine might be the better choice. You invest less with older equipment than with new. Thus your cost per hour can be substantially lower. Of course you have to run your own numbers for any new versus old scenario. You also need to ensure that an old machine is in reliable running condition. Don't be surprised if sometimes the old guy wins. Have a story about the advantage of an old piece of print finishing equipment? Feel free to share it below.